SPAIN INCREASES ITS BIOFUEL CONSUMPTION BY 15% ACCORDING TO THE ANNUAL BAROMETER OF EurObserv’ER | . : Blog Bioplat :. According to the new biofuels barometer, published by EurObserv’ER, Spain increased in 15% its consumption in biofuels during 2017. 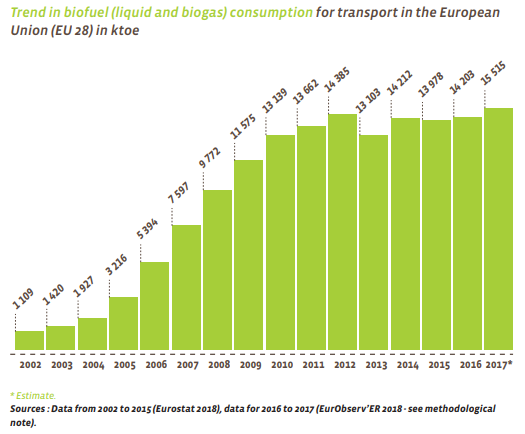 Most of this growth is due to an increase in the use of biodiesel of 17.1%; meanwhile the consumption of bioethanol grew by only 3%. This increase in the consumption is attributed to the mandatory rate on the energy content that distributors have to incorporate their fuels (4.3% in 2016 and 5% in 2017). For 2018, 2019 and 2020, the Royal Decree 1085/2015 stablishes mandatory targets for sales or consumption of biofuels of 6%, 7% and 8.5%, respectively. Regarding to the European panorama, the consumption of biofuels raised by 9.2%. France is the country with the highest growth in all member states (20.8%), followed by the Spanish case. The consumption of biofuels in Germany the most stable in Europe during the last three years. The barometer can be downloaded here.